Fully 74 percent of respondents thought that immigration from outside the continent was “not good” for Europe. The ratio was lowest in Germany and Austria, where 53 and 56 percent were against migration, respectively. 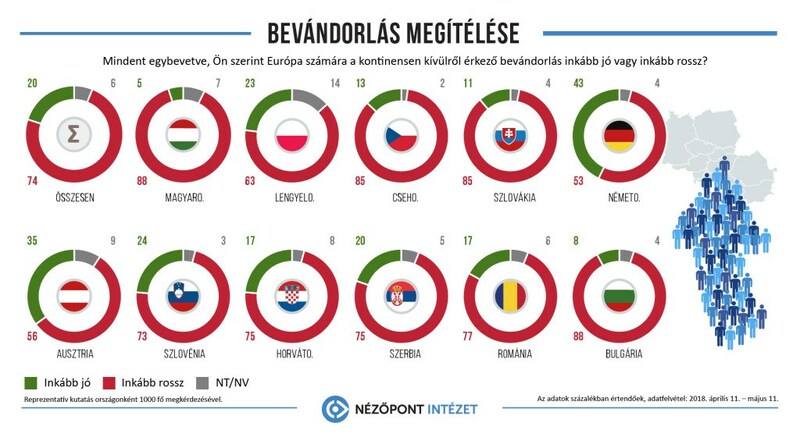 Those saying that migration was good for the EU came to 5 percent in Hungary, 8 percent in Bulgaria, 11 percent in Slovakia and 13 percent in the Czech Republic, Nezopont said. […] Two-thirds of all respondents said that Europe’s Christian culture should be preserved, and 30 percent said that new religions and cultures should be accepted. Giving preference to Christianity was supported by most respondents in Bulgaria (79 percent), followed by Slovakia (74 percent) and the Czech Republic (71 percent). Multiculturalism was accepted most among Croatians (37 percent), Germans (36 percent) and Austrians (34 percent), according to the survey.